****Test 6: volatge goes from 0.064V to 0.004V w start switch pressed. there seems to be a problem here I guess since we getting different readings. You said starter switch is working. Are you now getting voltage to the solenoid when you push button? If so, then there's a problem with your ground. And using sharp point of a test light will not harm your wiring in any way. That's why there is a sharp point on it. Don't confuse that with dull point found on most VOM's. Testing at a connection is better, but when that's not feasible, using the point to check a wire is common practice. Like I mentioned before, if your fuel pump uses a relay, it works off negative coil wires (blue/yellow, yellow/blue) and won't run until bike is cranking over. Solenoid needs 2 things to work...power and a ground. If you're getting power to it from starter button, then it's missing ground somewhere. cbr900Racer I tought ther switch worked but now am all confused.. 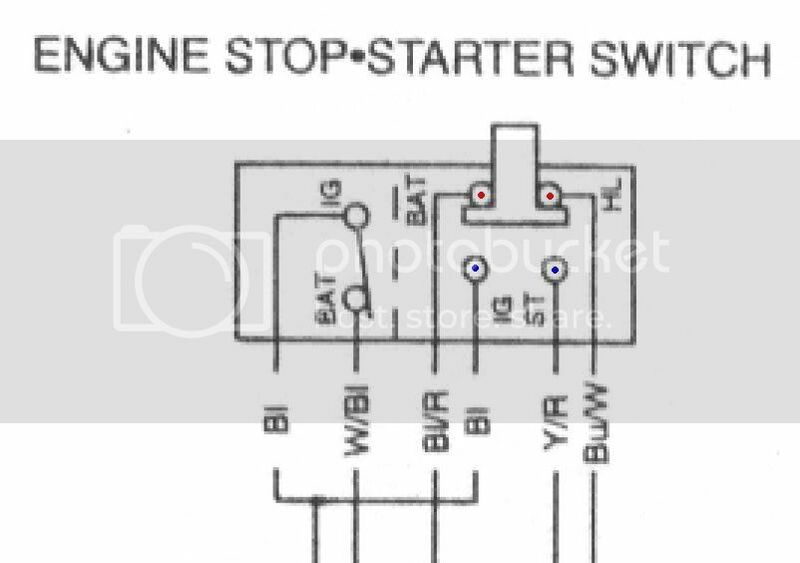 The starter relay has 4 wires going to it 1st Green/red ( ground) which is good I tested it following the manuel I down loaded..
2nd is red/white which is + 12v , 3rd red which is +12v also, Then yellow/ red stripe that comes from the starter switch. The yellow/ red wire i dont get power to it even when i press the start switch... I put 12v to this wire yellow/red stripe and bike turned over but didnt start. I didnt try for to long. It says to shift transsmision to neutral, measure voltage between yellow/red (+) wire and ground at the starter relay switch connector. Finally got my hands on a diagram that I could download. Check for voltage at fuse. It's the 10A next to a 15 that isn't on the end (hopefully it's marked on fusebox cover). It feeds black wire going to starter button housing. If it has power, you must be missing a ground going to solenoid. Other than solenoid being shot, that's the only things it could be. I checked those fused they all good, and that black wire has power going to the switch. 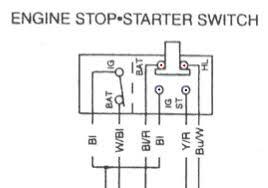 looking at the diagram the yellow/red wire coming out the starter switch should have power when start button pressed and it dose not. I checked the green and red wire on the starter relay/solenoid and its good ground.. Given what you tested so far, it looks to be in your started switch or wiring. Vigorously toggle the "OFF/RUN" switch. With the bike in N kick stand up, key on, Run switch on, clutch pulled in (Covering everything at once), press the start button (Wiggle your finger while pushing it in hard). If it is just corroded, it may crank and if so, you may be able to take it apart and clean it. Last edited by Procrastinator; 06-22-2010 at 11:38 PM. I did end up breaking the start stop switch unit.. the clip inside broke .. i will find one online some where.. Cool, glad you found it! Electrical troubleshooting can be a b!tch sometimes. Usually all it takes is a good diagram, pack of smokes (if you smoke like me) and a couple of hours. Just be glad it wasn't a short...then you'd really be cussing. You'll find the fork seals are alot easier than electrical gremlins LOL. Fortunately found this post... righ now i have the exact same problem with same simptoms on my 1990 hurricane. The difference is i don´t have 12v leading to the CDI also. Hope someone can help me too.